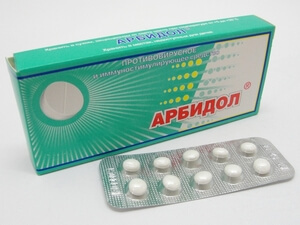 The active ingredient Umifenovir is available only under the brand name Arbidol and Arbidol maximum. No full analogues. As analogues in most cases, you can use other antiviral drugs and immunomodulators . Before buying an analogue, read its instructions. 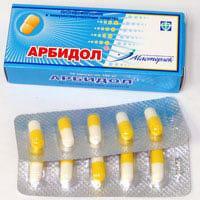 Arbidol is an antiviral agent developed by domestic pharmacologists. Effective in the treatment of influenza serotypes A and B, ORS (acute respiratory syndrome) with concomitant infectious diseases (pneumonia, bronchitis), ARVI. For prophylactic purposes, the drug is prescribed to support the immune status during the period of seasonal viral infections and to prevent complications during surgical interventions. adults and children from 12 years old - 200 mg every 6 hours. 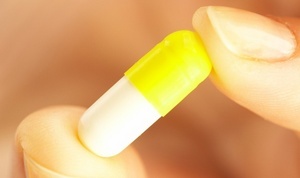 The duration of therapy is 5 days, then it is necessary to take a maintenance dose of 200 mg every 7 days for 4 weeks. children from 6 to 12 years old - 100 mg every 6 hours, the duration of therapy is 5 days. In the same dosage, the agent is prescribed for the treatment of influenza and acute respiratory viral infections without complications, but without a maintenance dose after 5 days of use. The same dosage is observed in the treatment of intestinal flu, chronic bronchitis, recurrent herpes. After 5 days of the main drug therapy, the dosage is adjusted by the attending physician. 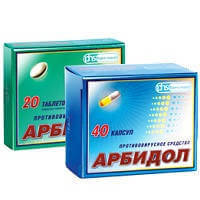 adults and children from 12 years old - 200 mg.
children from 3 to 6 years old - 50 mg.
children from 6 to 12 years old - 100 mg. In the midst of an epidemic of influenza and other acute respiratory viral infections, the frequency of taking the drug is increased up to 2 times a day in a similar dosage. The duration of preventive therapy with Arbidol during the epidemic period is 3 weeks. In order to avoid complications after operations, an agent in the same dosage is prescribed 2 days before surgery, on the 2nd and 5th day after it. Side effects when exceeding the therapeutic dosage of Arbidol is not marked. In rare cases, allergic reactions to individual components of the drug. The active ingredient of Arbidol is umifenovir. The substance is able to inhibit (absorb) hemagglutinin - the surface protein of the virus and suppress the fusion of the virus with the cell membranes of the body. Thus, the drug prevents the penetration of the virus into the cells and its spread. The concentration of the active substance is 50 or 100 mg per 1 capsule / tablet, depending on the form of release. The temperature in the room where the drug is stored should not exceed 25 ° C. The shelf life is 24 months from the date of production. The drug expired cannot be used. A prescription for vacation from pharmacies is required.